Ryoji Ikeda, known as ‘the master of minimalist electronica’, uses the beauty of mathematical precision to draw out the essence of sound and image, igniting a completely new visceral and aesthetic experience. Over the past two decades, the Japanese composer and digital artist has been exploring a wide range of creative formats, including live performance, installation and audio recording. The superposition show was commissioned by Festival d’Automne à Paris and it’s inspired by the world of quantum mechanics. 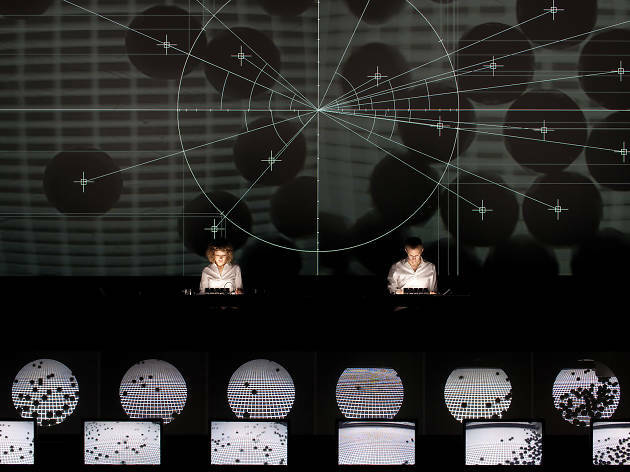 This astonishing theatrical concert features two performers who play non-musical instruments and interact with 21 video screens. 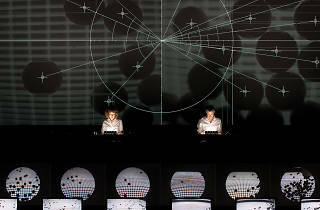 Orchestrating sonic and visual media into a mind-tingling piece, the pair integrates physical phenomena, mathematical concepts, human control and randomness into an awe-inspiring symphony of the universe.